My grandmother, whose name I share, was widowed on this date (March 27) in 1934, and left with two children to raise alone. She devoted her life to Bonnie Mae and to my father, Carol — not remarrying until after both had left the nest. She had a beauty shop (they were not called salons then!) 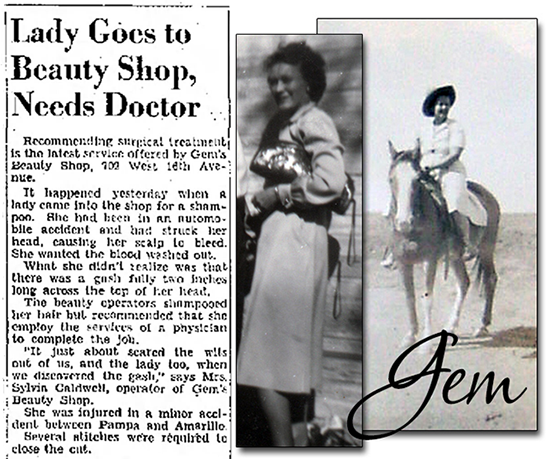 on 16th Street in Amarillo, Texas for many years — it was called Gem’s Beauty Shop, as this article notes. The name Gem came about when my granny was quite young — her sisters were named Ruby and Pearl. When she asked her parents why her own name was not Opal or some precious stone — her father told her that she was a rare “Gem” named Sylvia. And so, for her whole life, the family called her Gem. Back to the beauty shop: I discovered Newspapers.com this week. And in searching the old Amarillo papers online, I found this interesting story on Wednesday, June 19, 1940. It was a wonderful little window into my grandmother’s world. I remember going to her beauty shop and getting a shampoo with “egg shampoo” and a special creme rinse. Then she sat me up in her chair before the mirror and trimmed my wispy little red hair. Ladies in the shop would remark on my “pretty red hair” — and my grandmother would say, “Sylvia Dow is a strawberry blonde.” She was the only person in the world to make me feel beautiful. The photo in the center was made in Amarillo in the 1940s. How handsome she was, this Choctaw lady. On the right, she is on her horse — the caption on the back said, “Gem on the Rio Puerco”.